Some 3 000 people have had to leave their homes as New Zealand's largest forest fire in 64 years continued to burn for a fifth day near Nelson on the South Island. 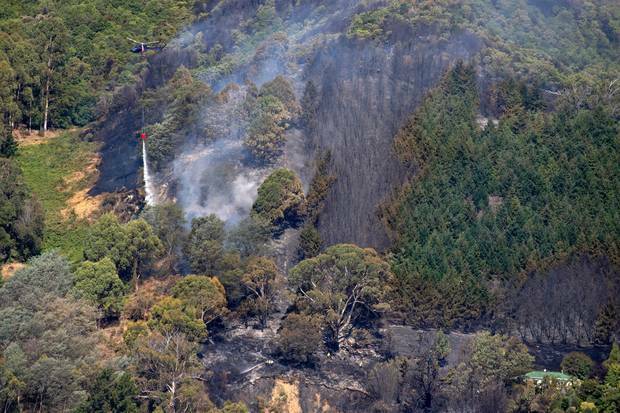 More than 150 fire fighters, 23 helicopters and two planes were on Saturday, 9 February 2019, battling the 2 100-hectare blaze near the South Island town of Nelson for a fifth day, with a state of emergency still in place, Fire and Emergency New Zealand said. 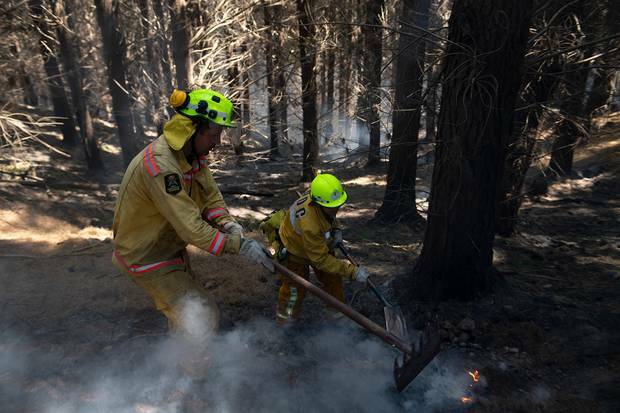 A fire fighter battling the Tasman blaze was hospitalised with dehydration but is out of danger, authorities said on Tuesday, 12 February 2019. Jim Frater, Civil Defence controller, gave the latest update on Tuesday afternoon on the fire and said that Pigeon Valley residents were allowed to visit their homes for two hours. Frater said about 500 people from about 200 properties remained evacuated. The ban of farm machinery use continues, he said and it was "sobering" that only one spark lit the fires. Trevor Mitchell, fire controller for Fire and Emergency, said it's been another good day but the fire remains uncontained. Conditions remain that sparks will easily ignited, he said. The weather was going to get progressively warmer before a southerly at the end of the week. Tasman acting area commander Zane Hooper said there will continue to be an increased police presence. The Wakefield police station will be staffed 24 hours until 15 February 2019. Then it will return to normal hours. Red Cross and police will be visiting all Wakefield properties tonight to provide reassurance. Tasman mayor Richard Kempthorne said he was sure Wakefield residents would be delighted to be home. But they'll still be feeling stressed, he said. "So look after each other," Kempthorne said. "I believe I represent everybody that's been evacuated in thanking those helping. It's been a mammoth effort," he said. The fight against the unprecedented Tasman bush fires has moved underground, with the squadron of helicopters' aerial attack scaled back, leaving fire fighters on the frontline, possibly for months. 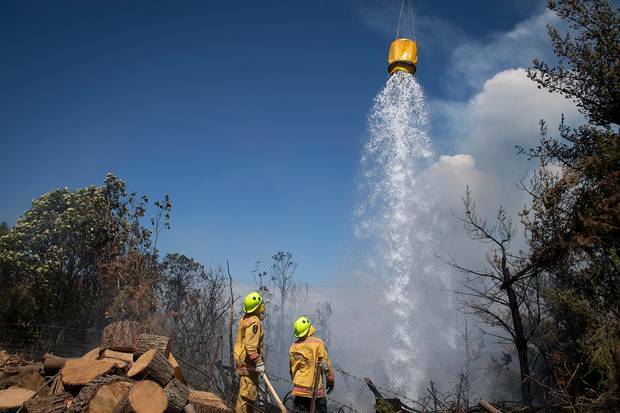 Fire bosses say around 85 fire fighters made good progress against the 2 000–hectare fire, as the massive fire fighting operation entered its seventh day. On Monday night, four drones hovered over the fire, about 30km south of Nelson, with infra-red technology detecting "quite a lot" of hot spots. Fire fighters are using hand tools, shovels and hoses, along with bulldozers and excavators to tackle the fire, which is burning deep under the dry ground. Once the hot spots have been churned up, the fire crews are dousing the area with water and going back hours later to check it's extinguished. 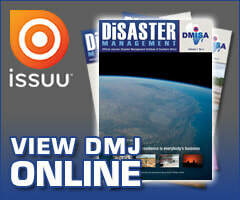 The process will take weeks, if not months, Trevor Mitchell, Fire and Emergency New Zealand fire controller said. He accepted it's going to be a "long haul" for his people and the local communities. The forecast for Tuesday was for changeable winds blowing from several directions but Mitchell said it looks like "another good day on the hill for our folk". There are around 190-200 fire fighters on the ground, Mitchell said, now working to four-day rotations. 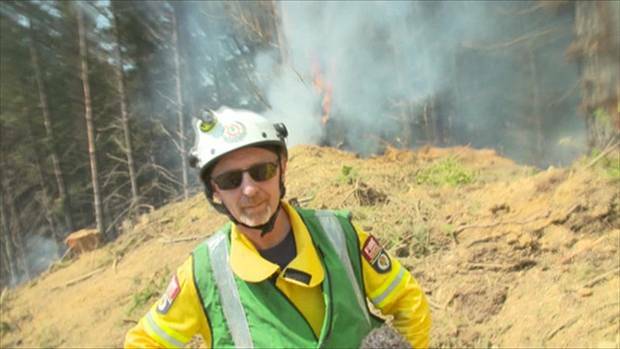 Fire and Emergency New Zealand was lucky to have around 12 000 volunteers across the country, he said, with everyone stepping up and wanting to help. Civil Defence controller Jim Frater said getting Wakefield residents home last night had gone well. But he stressed it was a conditional return and reminded people to stay ready to leave if fire conditions change. "No way are we out of danger just yet," he said. Authorities are looking to see if there can be a "conditional return" for residents of the valley areas. They are currently only able to get in for short-term access for a few hours a day. There are also ongoing discussions ongoing to see whether the formal Civil Defence state of emergency should be continued. There are now 600 people involved in fighting the blaze and managing the response. 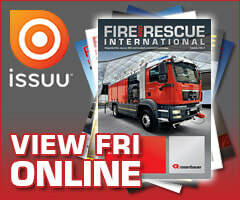 The fire threat could last for "weeks if not months", Frater said. "Just because you can't see it doesn't mean it's not real." 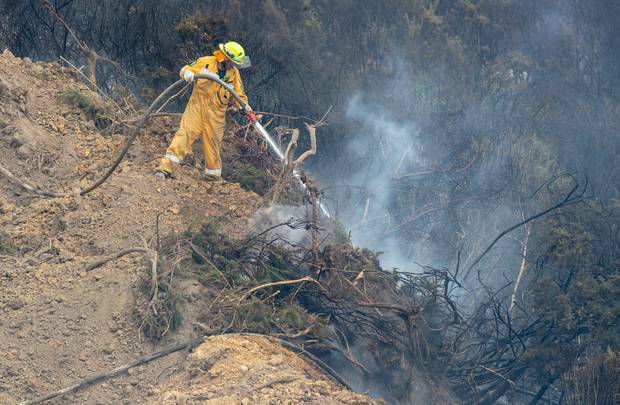 It was almost a full week since a spark flickered to flame and then all out fire last Tuesday, racing up a tinder dry Pigeon Valley hill, 30km south of Nelson and then much, much further. By the following Monday, 11 February 2019, New Zealand's largest forest fire since 1955 had blackened 2300 hectares of earth and still maintained a perimeter of 25km. It had taken one home, forced around 3 000 from others across a handful of valleys and in the Waimea Plains settlement of Wakefield and was the focus of thousands of hours of collective toil by 150 fire fighters from the far north to the deep south, the pilots of 23 helicopters and countless others both paid and not. All the while Civil Defence controller Roger Ball and Fire and Emergency incident controller John Sutton came out twice a day to update the public of the endless graft to gain the upper hand on fires that scorched earth within 2km of Wakefield, population 3 000 and within metres of some more rural homes. And as they again told Wakefield residents that it just wasn't yet safe to go home, the community did its best to step up with free accommodation, donated food in bellies and, when needed, arms around shoulders. But then, on Monday 11 February 2019, the expected high winds of the day before hadn't eventuated, fire fighters had had two really good days and yes, you can go home, Sutton, via media, told the 860 Wakefield households displaced by the forest fires. Around 400 in valley areas face a longer wait. "I've got the feeling that we're starting to turn the corner," he said, although he quickly added fire fighters would likely still be putting out the blaze in March and the bone-dry Tasman district's fire risk remained so high forestry harvesting and the use of farm machinery are still banned. Zane Hooper, the acting district commander for police, also sounded a warning, this time to rubberneckers with a sudden desire to visit blink-and-you-miss-it Wakefield. For now, don't, he said. Residents of the tiny settlement still have to be ready to evacuate again, if needed, with the fire risk still extreme. But come 17h00 on Tuesday, the community scattered by the threat of destruction began to come together again. And so, when Ball and Sutton and Hooper and the politicians stopped talking just after 4pm yesterday, their good news beamed live around the country, something new happened: Tasman District Council staff watching the announcements from the back of the press conference were clapping. Their applause spoke for so many. It was 14h13 on Tuesday last week when dad-of-two Joel Scott spotted flames in a paddock being tended to by a contractor for a farmer. "It was only the size of a barbecue fire," he said. Less than a minute later, the flames were racing up a hill and Scott was screaming to the 111 operator, "Your ground staff are going to be useless, just get the helicopters under way". The fire grew throughout Waitangi Day, when four fire fighting crews and three aircraft were pulled away to put out a suspicious 10ha fire at nearby Rabbit Island and the following day, Thursday, was particularly hairy. Sixty sheep rescued from Redwood Valley later had to be put down because of their injuries and MPI and SPCA staff, who through the week have been escorted onto properties where possible to feed and water stranded livestock, set trapped pigs free from a flaming pen before escaping the inferno themselves. Hundreds of animals, from birds to chickens to cats and dogs, were also being cared for at the Richmond Showgrounds by MPI, SPCA and animal charity HUHA. The disaster became more serious on Friday, when Wakefield residents were told to leave their homes and the fire nightmare continued with evacuations after another suspicious fire, this time at Walters Bluff in Nelson, again diverted resources from the main fire. The Walters Bluff fire was later extinguished with only a balcony lost but the main fire continued to grow. At last count it covered an area equivalent to 2 300 rugby fields, no surprise to the man who first alerted authorities. "I knew in the first two minutes that it was out of control", Scott said. As the three-day evacuation order for Wakefield came to an end, a rattled Scott was still preparing himself, he lives 8km south of Wakefield at Belgrove, for the worst. He's moved horses and cows off his property and was ready to go if the fire again took a turn for the worse. It's different when you've seen how fast a fire can move. "It still seems unreal. You couldn't do anything." Scott had a holiday planned this week and he went but then came home early. Those fires, they've disrupted so many lives, so many plans. But they've also brought out the best. Meanwhile, local businesses donated meals, church groups held day-long cook-offs and ordinary residents have filled trolleys with groceries for those most in need. Others offered beds and even entire homes to those without a roof over their heads as the fires raged. 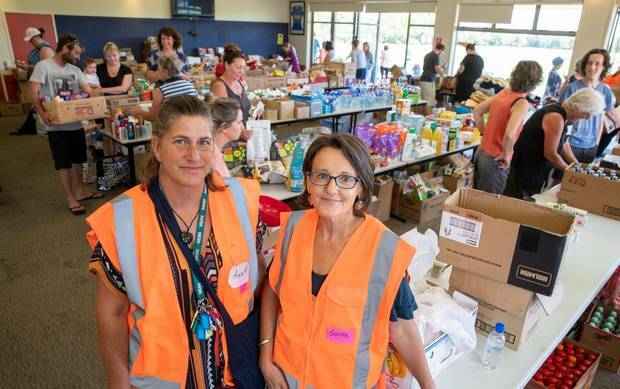 The efforts of the volunteers was on full display at the Nelson Suburbs Football clubrooms in Stoke, where donated loo rolls were stacked almost to the ceiling in the men's changing room and mini-supermarket of free items for evacuees took over the bar room. Volunteer organiser Janine Thompson, working up to 14 hours a day on five hours' sleep and hugging the sometimes tearful arrivals, personified the efforts of many when she pushed past fatigue to do her bit. "This is something I can do. This is how I can contribute." Wakefield evacuee Terry Coleman was also pushing through the hard times when the fire was at its worst and he was forced to park his caravan-turned-temporary home in an Aniseed Valley paddock and face the fear that he might not have a home to return to. In the heat of the day, Coleman sheltered under his awning and looked at the smoke-hazed Waimea Plains. At night, he took comfort in looking toward that other great unknown. "I just sit around and gaze at the stars. What can you do?" But, as Coleman watched and Thompson hugged and Scott came home early from holiday and even as more residents, this time in Wai-iti, south of Wakefield, were told on Saturday to prepare for possible evacuation, the hard, dirty, unglamorous slog of the fire fighters was giving hope. And still, the fight goes on. Another fire controller, Trevor Mitchell, said on Monday, fire crews are now working on strengthening the containment lines, checking forecasts and identifying pressure points. Today had been "a bit breezy" but they were doing okay, Mitchell said. "Things are looking reasonably comfortable." The last few days fire controllers like Sutton and Mitchell, have remained careful with their language but their growing confidence in the battle against this devastating blaze has also been hard to miss. Long may it continue.